Greetings from Ross Island, Antarctica! 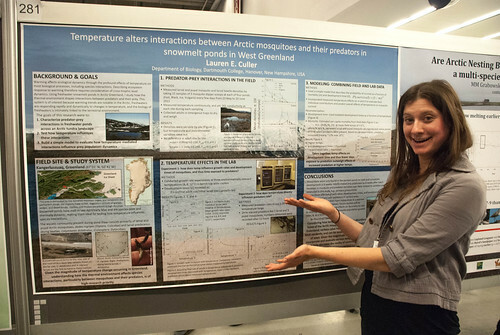 I, Ali Giese, am currently waiting for a good weather window to fly out to my research field site 800 km away. At Roosevelt Island on the eastern side of the Ross Ice Shelf, I am involved in an 8-nation project to reconstruct the climatic and glaciological history of the Ross Sea region since the last ice age. The eastern side of the embayment is the missing link in understanding how this critical region has responded to climate changes in the past, and a more detailed understanding of the climate changes and associated ice behavior will enhance our ability to inform projections of sea level rise into the coming centuries. Under the advising of Bob Hawley in Earth Sciences, I am officially involved in investigating the temperature of the ice as well as the structure and spacing of the ice layers. I am down at the bottom of the world before Bob, however, because I wanted to be involved in the ice core drilling process. 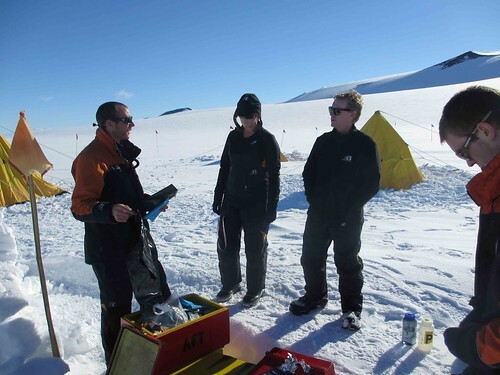 Our New Zealand collaborators are drilling an ice core to bedrock (750 meters; roughly 30,000 year old ice), and the measurements I’ll be assisting Bob with will involve lowering instruments into the hole once the ice is removed. Compared to Greenland, which is a 3 hour drive and 5 hour flight from Hanover, Antarctica is considerably more logistically complicated. 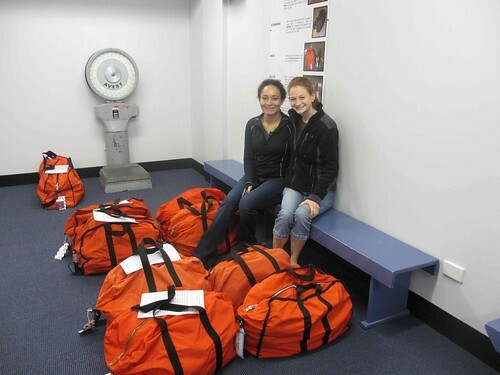 The US Antarctic Program (USAP) is staged out of Christchurch, NZ, where scientists typically spend the two nights before their ice flight. I left New England on Thursday Nov. 24, went over the Int’l Date Line and never (or only briefly) lived on the 25th, and arrived early evening on the 26th after 3 layovers. 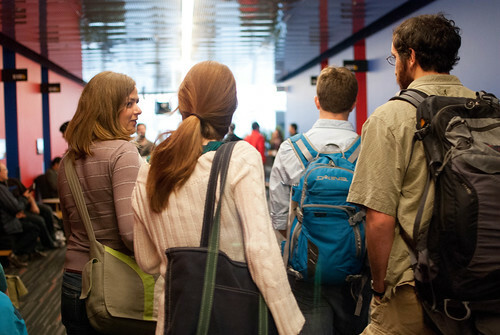 (During one of these layovers I met up with fellow IGERT student Becca Williams, who will be on the volcano Mt. Erebus with Yeti, the autonomous crevasse-detecting robot). Becca and I picking up our ECW (extreme cold weather gear). Allocating a long layover in Christchurch is required for gear outfitting at the Clothing Distribution Center; we load up with everything from huge coats (affectionately and widely known as “big red”) to rubber, air insulated “bunny boots,” hats, insulated pants, long underwear, and everything else you can imagine. 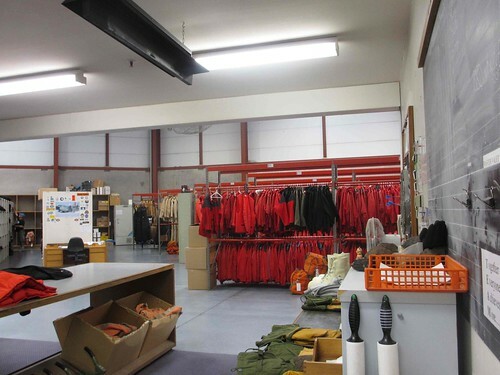 The warehouse at the Clothing Distribution Center at the International Antarctic Centre. Fortunately, trying on gear and watching orientation videos doesn’t take more than a few hours, and we had almost a full day to enjoy summer in Christchurch. I took the opportunity to visit the botanic gardens and to check out the rebuilding of the city. 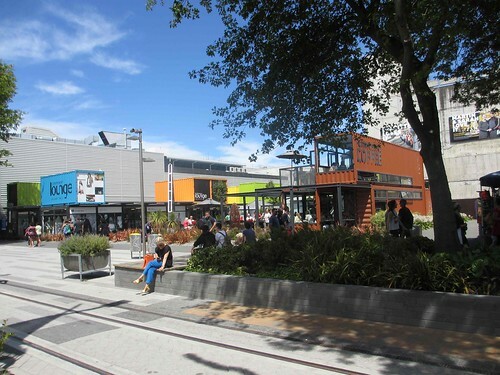 Because Christchurch was not thought to be in an earthquake zone, none or few of the buildings were built to withstand the magnitude 6.3 earthquake which originated from a very deep fault and shook the city in February 2011. Much of the city center is still in ruins and covered in scaffolding, but many of the businesses have relocated into a vibrant downtown area constructed from shipping containers. There are still tremors, and the residents are cautiously rebuilding with fierce commitment and palpable dedication to their city. 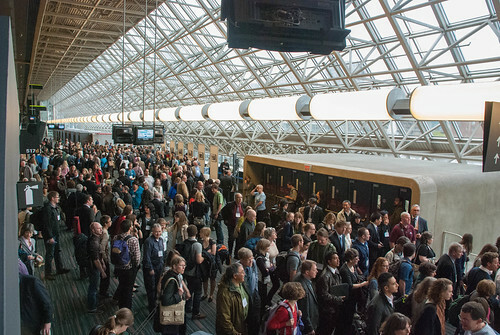 On Monday, we reported to the Christchurch airport at 4:30 am for our C-17 flight to McMurdo. The flight itself, other than being delayed, was uneventful and surprisingly cushy! We were provided with lunch and a plethora of snacks, and we even had seats that folded down from the sides of the plane, a vast improvement over the cargo nets of the C-130s. Because the windows are few and small, I didn’t take in my first few of the frozen continent until we landed. I would not be exaggerating in stating that travel to Antarctica has been a life-long dream, but full realization of my location didn’t register until I was out on the ice shelf camping the following night. 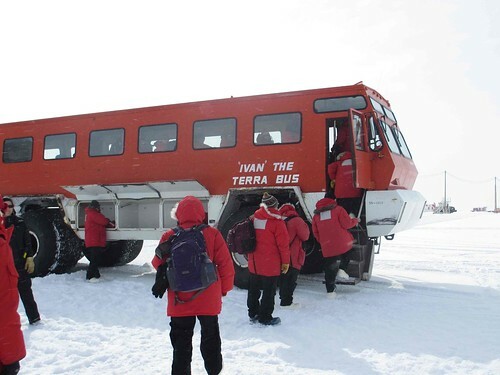 I really couldn’t believe where I was as I walked over the flat white expanse and was ushered into Ivan the TerraBus, which shuttles newcomers the one hour from Pegasus runway to base. 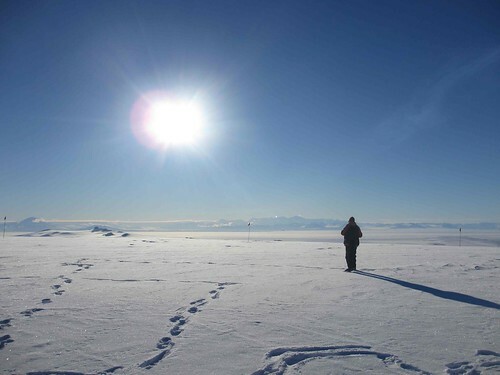 I am in a unique and, in my view, extremely fortunate position since I am working with Kiwis, and my arrival in Antarctica far precedes that of the other Americans on the project. As a result, I was assigned to stay at Scott Base, the New Zealand base, rather than at McMurdo Station. McMurdo is a city by Antarctic standards, by far the biggest base on the continent, and a large industrial operation. The Kiwis tell me there are 1200 people there right now, and McMurdo has a pier for ships, countless dorms for scientists, a taxi service, a hospital, a church, yoga classes, etc. 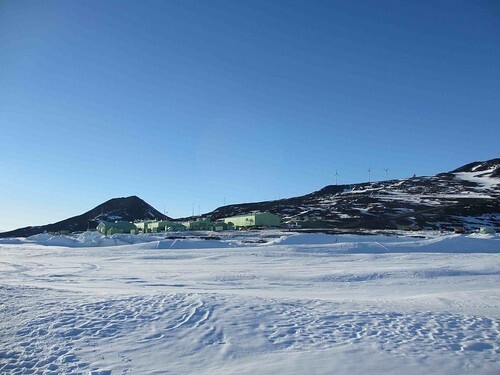 Scott Base, in contrast, has fewer than 60 residents at present. The base is a number of connected buildings with a community so small that I knew most of the base staff within my first two days (admittedly, the fact that they know me probably has something to do with my distinguishing accent and US-issued red clothes). The Kiwis have been extraordinarily welcoming, right from the moment I was wandering around confused after the US bus dropped me off on its way to McMurdo, a few miles down the road. An orientation and tour took up the remainder of Monday, and Tuesday I began a 2-day field training, the highlight of which was camping on the ice Tuesday night. We learned how to assemble tents designed after British explorer Robert Scott’s, we practiced using Primus stoves, and we built survival snow shelters with shovels and saws (the latter for cutting blocks and building walls). Richie, our field trainer, reviewing the kitchen box and food waste protocol. Our anomalously warm (-7C) and barely breezy weather prompted our guide to suggest a trip up towards Mt. Erebus, the volcano, to a location known as “room with a view.” We drove up there in a hagglund, a military vehicle from Desert Storm, I am told, which would have taken an hour had it not been for the multiple photo stops. 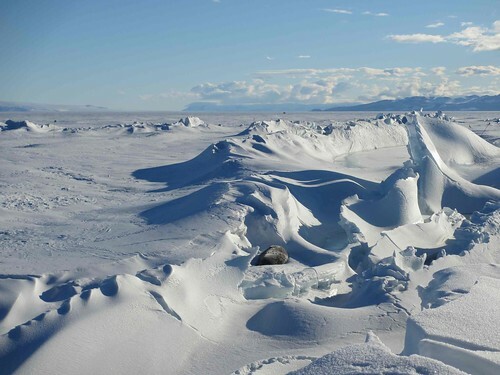 From there, we saw many of the islands in the ice shelf, took in a breathtaking view of the Transantarctic mountain range, and could almost make out the early explorers’ huts. The view from our evening excursion destination. 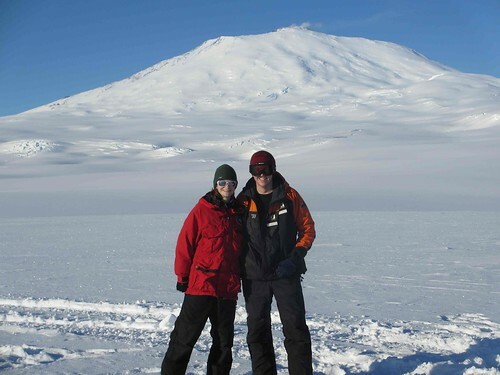 Luke, another Roosevelt Island student, and I with the Mt.Erebus volcano in the background. On Wednesday night, Luke, the other student joining the Roosevelt team at this time, and I were informed that a Basler plane had become available and that we would try to fly out to our field site the next morning! This was a bit of a surprise since we weren’t originally scheduled until Monday, but we quickly packed and weighed our bags and spent the evening preparing for being in the field. Neither Thursday nor Friday had favorable weather conditions at Roosevelt Island, and after two early mornings waiting for weather reports, we’re still here and will try for a flight again on Monday. While I am anxious to get out to the field and start working, it’s hard to complain about having extra time in a warm base with fantastic people. I’ve had the opportunity to catch up with friends staying both here and at McMurdo (quite ironic and fun to meet up with friends I haven’t seen for years at the bottom of the world), and I’ve been able to see some of the local sites, including the pressure ridges that form where the sea ice meets the shoreline right below Scott Base, Observation Hill where Scott’s men waited and waited for their companions who perished on their return from the pole, and Discovery Hut built for Scott’s first expedition and used for accommodations on subsequent ones. 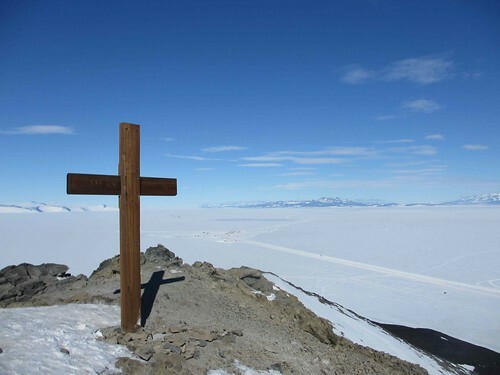 The view from the top of Observation Hill and the cross which commemorates Scott at its summit. My perception of Antarctica so far is that of a land of contrasts: social and isolating; breathtaking and dangerous; peaceful and windy; overwhelming and thought-provoking, all at the same time. The oil containers look out of place against the backdrop of an undisturbed white wilderness, and the distinction between the perfectly flat ice and the neighboring mountains appears somewhat unreal. 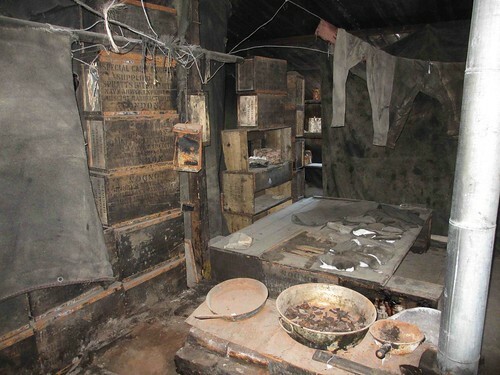 The seal blubber frozen by the door in the Discovery Hut, as well as the uneaten biscuits and pants hanging to dry, serve as reminders of the hostility of the environment and the great sacrifices made to explore this last frontier. 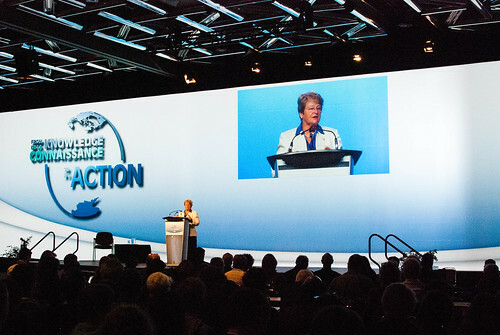 Reflecting upon the feats of the early explorers and learning about the myriad scientific projects on the continent have been humbling, to say the least. I feel extremely grateful to be here and am crossing my fingers for good weather on Monday. *The anniversary of the signing of the Antarctic Treaty on December 1, 1959.